Our surface. Our installation. Our expertise. 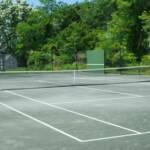 Most of us know the rules of tennis dictate the length, width, and placement of lines on the tennis court. And where character difference come into play is with surface. Various surfaces have various characteristics which affect the model of play. That's why it is important to select the right surface for your playing needs. A clay surface has its advantage over the typical asphalt or concrete hard surface. They allow for a different level of tennis where more control is required on the player's part. The clay surface absorbs more impact than the hard surfaces. This translates to less impact on the player's body which can reduce many types of discomfort and injuries. These innovative courts have a built in watering system that hydrates the court from underneath. These court surfaces conserve water and on average are 20 degrees cooler than a hard court. Another advantage of a sub-surface irrigation system is that they are playable ALL (no mid-day maintance) of the time translating into no down time for players. 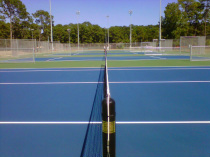 All Weather Courts are consist of rock, ashpalt and sand-filled acrylic surfacing and are a popular choice. Cushioning systems can be integrated for a more cushioned surface.